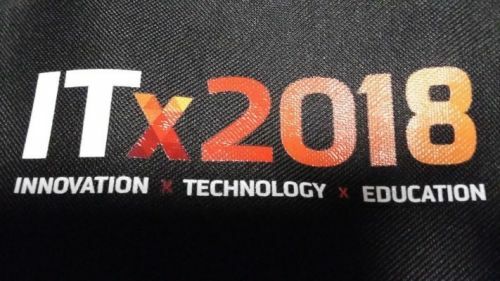 Did you go to ITx2018? One umbrella conference for 12 Tech Conferences. Three days of tech inspiration, learning and networking. While I've tried to share as much as I can, this post does not do justice to the incredible experience that was #itx2018. I'd like to include a proviso that these notes have been transcribed to the best of my ability and apologise in advance for any changes that anyone needs to notify me about! COMMITMENT FROM THE NZ GOVERNMENT Great to hear Clare Curran, our Minister of Communications, pledge the Government's support of the tech sector here in New Zealand. Clare spoke about tech being an enabler of the new economy - allowing for greater social inclusion, better delivery of better public services, and a more participative economy for NZ. She articulated her vision for a fair economy where we can all benefit from opportunities that tech provides. Sounds like there are some real changes afoot - with a new approach to IT procurement, aiming to make it easier for SME businesses (that's You and SME!) to win government business through the marketplace of government. There was so much covered in Clare's Ministerial Welcome - the new Digital Skills Curriculum, an AI Action Plan, and Cybersecurity skills shortages. FRESH VISION If there's one thing so many of us got from #itx2018 - it's fresh vision! The first keynote speaker Colin D Ellis, from Melbourne was funny and spot-on with his inspirational speech. I didn't know you could laugh so much at an IT conference! Colin outlined 'How to Create an Agile-ready culture', sharing that a key factor to close on your digital transformation is to have a great culture. People are of course central to all this. Conversation is at the heart of great culture. Human beings are at the heart of everything. As Colin said - 'We do our best work on the edge of uncomfortable'. He then proceeded to de-bunk a whole lot of myths around culture and Agile - reinforcing that people deliver projects, not process. LOOK AFTER YOUR PEOPLE - HE TANGATA, HE TANGATA, HE TANGATA No write-up of #itx2018 could be complete without mention of Jacqui Maguire's keynote on 'Resilience and Mental Wellbeing - How to protect you and your staff'. The topic of mental health is suddenly being discussed by all sorts of people, all over social media. Jacqui is a vibrant speaker, who really cares deeply and cut right to the heart of an issue that so many NZers are facing. The audience was really listening. I'd give Jacqui the prize for most-photographed keynote speaker, and for the most remembered word - 'flourishing'. There was also a panel discussion on creating a culture of positive mental health. Thumbs up to the brave people who courageously shared. TAKE THE PEOPLE WITH YOU This was a strong theme that ran through many of the keynote presentations and seminars. Essentially - tech is great, but there's not much point in being technologically advanced if our society (or parts of it) get left behind. Clare Curran's Ministerial Welcome kicked off this theme, with Clare stating that taking advantage of digital opportunities needs to be at the centre of decisions, while still bearing people in mind. The Government need to improve the wellbeing of NZers and families. The impact of a great tech industry is wonderful for many of us - but Clare also mentioned concerns about inequality and the potential impact on our regions. The 'Women in IT' Stream, on the last day of #itx2018, discussed ways to help more women get involved in IT and the opportunities in the sector. A 5-person panel discussion moderated by Victoria MacLennan was followed by Amanda Santos' explanation of 'Why we have to hire interns and keep IT talent in NZ'. Some very practical tips from everyone - thanks! I didn't get to the Maori in IT, or the IT and Society stream, but would have loved to hear more about what is happening in these areas. How can people survive in an era of exponential technological change? What do we do to support those who do not fall on the upside? Will democracy survive Big Data and AI? In another keynote, Kaila Colbin spoke about 'Riding the Exponential Wave of Change'. Our future landscape includes many tech industries (not just computing!) with doubling growth curves - AI, Robotics, Biotech, Nanotech, Gene Sequencing, Energy. So much change, at an ever-increasing rate - we need to hang on and enjoy the ride as much as possible! automation, but we are seeing more inequality due to automation. OUR MODERN-DAY RACE TO THE NORTH POLE Tech is our modern day holy grail. Tech is the space where we'll see nations rise and fall over the next decade, in the race to our North Pole of Innovation. Let's not lose ourselves in the pursuit of excellence. 'What kind of future do we want to create?' This is the biggest challenge. We need to make decisions together, not just look at that decision in isolation. We need to create a better world - not just an automated version of the current world. GREAT FOOD AND LOTS OF IT So much food for thought - it was a good thing that the catering was great! Lunch and snacks here were better than I manage on most days (although there's always Vogel's muesli and some thick Greek yoghurt in our kitchen!). From banana boats filled with vegetables and salads, to mini pumpkin fritters, beef sliders and individual paper cones with fish and chips - there was something for everyone. Special dietary requirements were also catered for. If you forgot to have breakfast, the fruit stands provided a great opportunity to start your day well. The buzz bars ran out, but that's got to be a good sign. Those who wanted a sweet treat gravitated towards chocolate brownies, ice cream sandwiches, doughnuts etc. As much as possible, I tried to steer clear of these - when you're over forty, you end up wearing this stuff for six months if you're not careful! CUSTOMER SUCCESS I know - #itx2018 is an IT conference, not a sales conference. As a salesperson, it was exciting to see the threads of Customer Success weaving through so many presentations. When we design products and services that meet our customers' needs, we build a place for our customers to be successful and feel welcome. That's just got to be good for company sales! I particularly enjoyed hearing from Doug Kim, Senior Content Editor at Microsoft USA, whose keynote 'Empathy in an AI World' introduced the principles of Calm Design. We need to stop competing for attention and start designing for respect. Coming towards the end of the conference, Doug had the benefit of hindsight. He noted that we talked a lot at ITx about how to change culture, respect each other, and create a flourishing environment. We need to Start - building things that are individual, personal, and empathetic to everyone's needs. 'These are the moments that we ask for. What are we doing to support that? I can't help thinking that if we all designed with this awareness at top of mind, that we'd create even better solutions for our customers to be successful in their worlds. NETWORKING Networking. Meeting People. Socialising. Whatever you call it, there were ample opportunities to meet and greet people from Government departments, large corporates and some SMEs. It's always good if you leave an event with more friends than you entered with, and this was certainly my experience. The set-up in the front of the TSB Arena, with stands surrounding the food-serving area was conducive to mingling and great conversation. SPONSORS AND ORGANISERS Nothing like #itx2018 would be possible without Sponsors. It's only by experiencing the depth and the breadth of the ITx offering that I could really appreciate why the tickets were such a significant investment, and just how much each ticket was probably subsidised by the generosity of the sponsors. Special thanks to all the organisers who must have given hundreds of hours to get the machine that is #itx2018 up and running. Awesome job! WHAT'S NEXT? A sure give-away that you've enjoyed an experience, is a statement that you'd go again. Yes ITx - I will be back! This summary first appeared on Mary Crompton's LinkedIn page. Cross-posted with her permission.